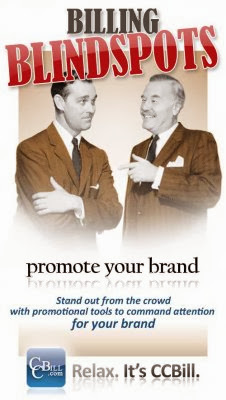 Stand out from the crowd with promotional tools to command attention for YOUR BRAND. Each touch point on your site - including your joining process - hints to your consumers what kind of product they are about to buy. Consistent branding, custom payment pages, branded receipts —even custom confirmation pages — provide power to your brand and comfort to buyers. Studies show that people need to hear a name THREE TIMES before they remember it. How are you getting them to hear your offer through all the e-noise? · Marketing Lists – download your member lists, past and present, for external campaigns and follow-up. SPAM them with love. · Membership Details – use membership details to understand your market. Many of our clients track their membership locale and usage to help decide where to advertise locally. In our unique market, print ads do work! · Affiliate Reports – in a world of thousands of programs and millions of CCBill affiliates, let them know who you are. Your affiliates are people too. · Branded Email Receipts – email is an easy impression. Is your logo in their Inbox? · Branded Exit and Timed Pop-Ups – if consumers are on the site and not choosing to buy – they are choosing not to buy, yes? Exit pop-ups can reinforce a brand, provide an alternate offer or promote additional sites under your program, which may get their attention. And you can time them to pop-up whenever you want – in case the surfer has been lingering a little too long without buying. · Branded Payment Pages – it’s hard enough to get consumers to pay, so make sure that they know that your brand is trusting the best to take their payment. Co-branded payment pages with CCBill and your logo provide a seamless and trusted transaction process for your members. More than just a processor, CCBill is an e-commerce platform. We have a menu of marketing and branding tools to help promote your trademark and boost recognition, ultimately driving more sales. By leveraging CCBill’s distinctive marketing tools, you can spread the word to potential buyers that your brand is definitely worth looking at. GET THEM TO KNOW YOUR NAME. Don’t know how to do any of these things? It’s okay. Contact our 24/7 Client Support Team for help getting started with any of our loads of exclusive features at clientsupport@ccbill.com. Don’t have an account with CCBill yet? Our sales executives at sales@ccbill.com can help get you started using the proven leader in taking payments online. You can also call them directly at 855-4-CCBILL .